This is why we can’t have nice things. 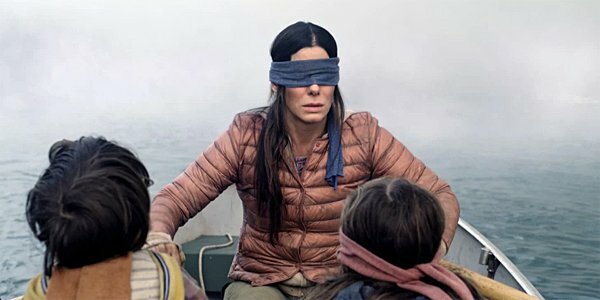 Netflix’s Bird Box has not only inspired many Twitter memes it also appears to have inspired several Darwin Awards nominees. There is such a thing called the #BirdBoxChallenge, with fans of the Sandra Bullock film challenging themselves to do certain tasks blindfolded, like the characters in the horror movie. People have taken that so literally they are dragging their children around until they slam into walls, walking down city sidewalks blindfolded, and even driving with blindfolds on. Sigh. A Layton police officer told CBS News there was another 16-year-old in the car at the time of the crash, which happened while the driver was attempting a Bird Box Challenge move on Layton Parkway. It’s a good thing there were no injuries. You have to imagine their parents weren’t thrilled. Teens pull crazy stunts all the time, but they aren’t the only ones doing this Bird Box stuff. Face it: If a real _Bird Bo_x situation happens, you are not going to be able to pull it off like Sandra Bullock’s Malorie. Only she can raise two children, travel through the woods, and row down rapids in an apocalyptic world where sight is deadly. Malorie is fictional, though, and even Sandra Bullock admitted she walked into cameras on set. Netflix even reached out with a warning for people not to do the Bird Box Challenge. It’s sad that they felt the need to do that. Most of us get ourselves into enough trouble when we can see the stuff in front of us, so you can imagine the nonsense people have been getting into while blindfolded. People who are blind or visually impaired must be so embarrassed for us. Hopefully this doesn’t create a chilling effect where shows feel the need to hold back in case people get The Wrong Idea and do something foolish. You know someone out there is going to hurt themselves or someone else and try to sue Netflix for the idea. Even though Bird Box was based on a book. And in the movie when they wanted to drive, they covered up the car windows as best as they could instead of blindfolding themselves. Bird Box has been an unexpected social sensation in this way, and also set a viewing record for Netflix that the Nielsen numbers mostly backed up. Director Susanne Bier has already been asked about a potential sequel, picking up from that ending, but she’s taking some time to savor the moment. But now maybe Netflix will be too afraid to give fans a sequel, or it will have to come with a series of warnings. We are the real monsters!